F3RES is a group scored thermal duration contest for low tech 2 meter span RES gliders. Each round comprises a duration task of 6 minutes in a 9 minute working time. 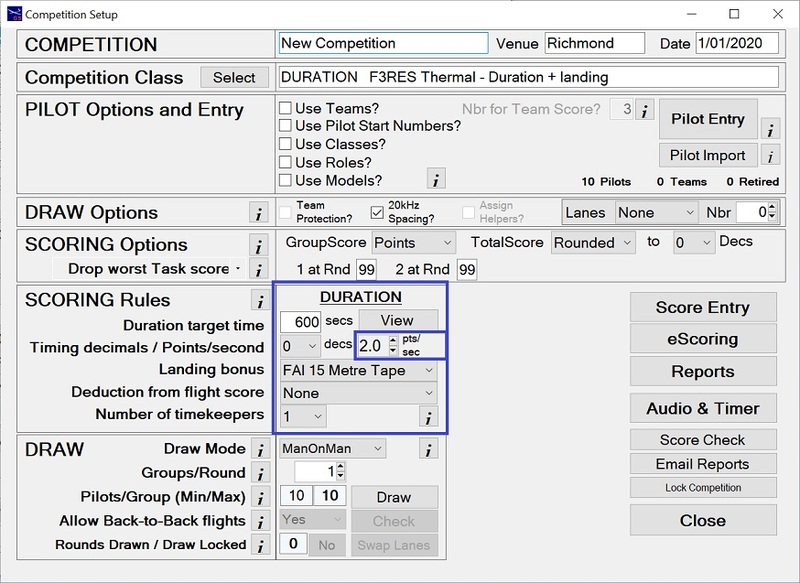 Unlike most competitions, with F3RES the time points are 2 x (flight time in seconds). Landing points are exactly the same as for F3J. This is not an FAI class (at 6 November 2017). The rules are in German but there is an English translation dating from 2016 on RCGroups. Apparently there have been some changes since this was done but no translation is available. If you find a better or more current translation then please let me know. Expand F3RES on the side menu to work through these features. - Set the 'Points/Second' to 2.